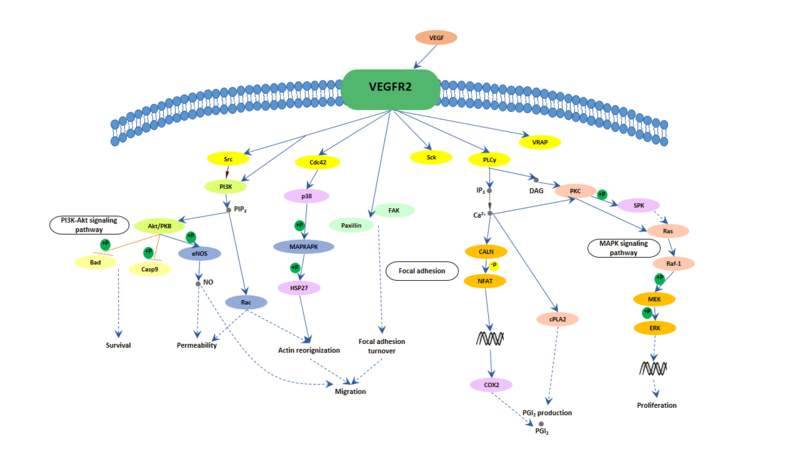 Actually, there is now much evidence that VEGFR-2 is the major mediator of VEGF-driven responses in endothelial cells and it is considered to be a crucial signal transducer in both physiologic and pathologic angiogenesis. As shown in the following picture, when a VEGF binds to its receptor, the receptor can transiently exert its kinase activity and form a complex with an intracellular tyrosine or serine/threonine kinase. Then, the activated receptors result in the activation of other proteins in the signaling pathway and the production of various second messengers. Finally, these signals are transmitted into the nucleus and induce the expression of specific genes. Now, although the evidence that VEGFR-2 is the major mediator of VEGF-driven responses in endothelial cells also is not very much, it is considered to be a crucial signal transducer in both physiologic and pathologic angiogenesis. The binding of VEGF to VEGFR-2 leads to form receptor dimer, then, followed by intracellular activation of the PLCγ; Subsequently, PKC-Raf kinase-MEK-mitogen-activated protein kinase (MAPK) pathway and initiation of DNA synthesis and cell growth, whereas activation of the phosphatidylinositol 3'-kinase (PI3K)-Akt pathway leads to increased endothelial-cell survival. Activation of PI3K, FAK, and p38 MAPK is implicated in cell migration signaling.